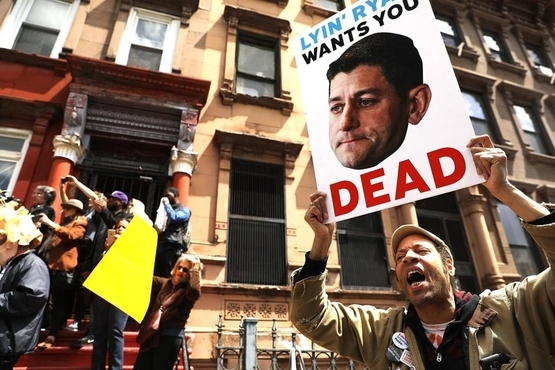 Democrats protest in front of a Harlem school last week before the expected visit of House Speaker Paul Ryan. THE ANONYMOUS comment sections of many publications are notorious for their incivility and malignant smears. But in the debate over replacing Obamacare with a Republican alternative, the American Health Care Act, the online trolls and fever-swamp fanatics have been hard to distinguish from mainstream politicians, journalists, and commentators. Listen to some what passes for political discourse these days. "Donald Trump and Republicans just celebrated voting to let thousands of Americans die so that billionaires get tax breaks." Those are the words of a prominent US senator. "They" — Republican House members who voted for the AHCA — "should be lined up and shot. That's not hyperbole; blood is on their hands." So fumes a professor at the Art Institute of Washington. "I hope every GOPer who voted for Trumpcare sees a family member get long-term condition, lose insurance, and die. I want the GOPers who support this to feel the pain in their own families. . . . I want them to be tortured." Those sentiments are expressed via Twitter by a senior writer at Newsweek. "The GOP Plan For Obamacare Could Kill More People Each Year Than Gun Homicides." That's the headline in Vox, a popular news and opinion website. There is no shortage of additional examples, just as enraged or hysterical. So much fury over dead Americans! So much loathing for ghouls who murdered them! A neophyte in the public square, encountering all this shrieking about blood and killing, might imagine that the nation was erupting over a military operation gone wrong, or a plot to release terrorists from supermax prisons. But this is what discussions of public policy sound like now — even when the issues in contention are about insurance subsidies and Medicaid waivers, not war and peace. The most deranged charges are casually lobbed at political opponents, with little regard for truth. Political debate in America has grown so poisonous that it no longer comes as a shock to hear Democrats accuse Republicans of favoring changes in Obamacare because they want people to die. It isn't only nameless crazies in some unpaved alley of the internet who verbalize a desire to see conservatives "lined up and shot." Now writers for well-known newsmagazines tweet such vitriol too. Some progressives justify the shredding of civil discourse; with Trump in the White House, they say, courtesy is a luxury the nation can't afford. "America, don't be polite in the face of demagoguery," exhorts Jessica Valenti in the Guardian. Representative Ruben Gallego, an Arizona Democrat, is likewise unapologetic about resorting to rhetorical brutality. "This is a new time in politics where people are just blatantly lying and essentially producing policies that are going to kill people," Gallego tells CNN. "I think the old time of civility needs to go until we actually go back to the rules." Trump's crude insults and noisome vulgarity are foul indeed. But the "old time of civility" was crumbling long before Trump entered national politics. An endless array of revolting political slanders was hurled against George W. Bush, for example — that he was a Nazi, that he ought to be assassinated, that he had advance knowledge of the 9/11 attacks. Those attacks came not just from moonbats on the far-left fringe, but from respectable, mainstream pundits and politicians. The collapse of respectful discourse in public life began decades ago. And if for many years it was a more common phenomenon on the left, too many on the right have learned to traffic in wild accusations and hateful talking points as well. It was a Republican, Senator Tom Coburn of Oklahoma, who told senior citizens back in 2009 that if the Affordable Care Act passed, "you're going to die soon." It was Representative Michele Bachmann, another Republican, who railed on the House floor that Obamacare "literally kills women, kills children, kills senior citizens." It was Sarah Palin, a GOP governor and vice-presidential nominee, who warned that under the ACA, the sick and the elderly would "have to stand in front of Obama's 'Death Panel'" and have bureaucrats decide if they live or die. If, as a liberal, you were disgusted when Republicans resorted to such toxic arguments then, you should be horrified to hear your fellow liberals resort to them now. Conversely, if you're a mainstream conservative sickened at the way Democrats now play the "death" card, did you have the same objection when the GOP was doing so during the Obama years? There were legitimate arguments to be made for and against enacting Obamacare; there are legitimate arguments to be made for and against replacing it. There are decent ways to argue that a given bill may have grave unintended consequences. But it is wholly illegitimate and indecent to portray those who disagree with your view as eager champions of death and suffering. It is vile beyond words to avidly wish for them to be "lined up and shot" or to "be tortured" by the death of loved ones. Such fury should be deployed against the real monsters who threaten us — not against fellow Americans guilty of only a different political outlook. If we have forgotten how to tell the difference, we are in bigger trouble than we know.